Location: Set back from the main road and prominently sited on the E side of Y Maes. The building was erected as a memorial to the First World War, the cost raised by voluntary subscription, donations and fund raising. It was designed by D.O.M.Roberts, of Owen Roberts and Son, architects, of Porthmadog. 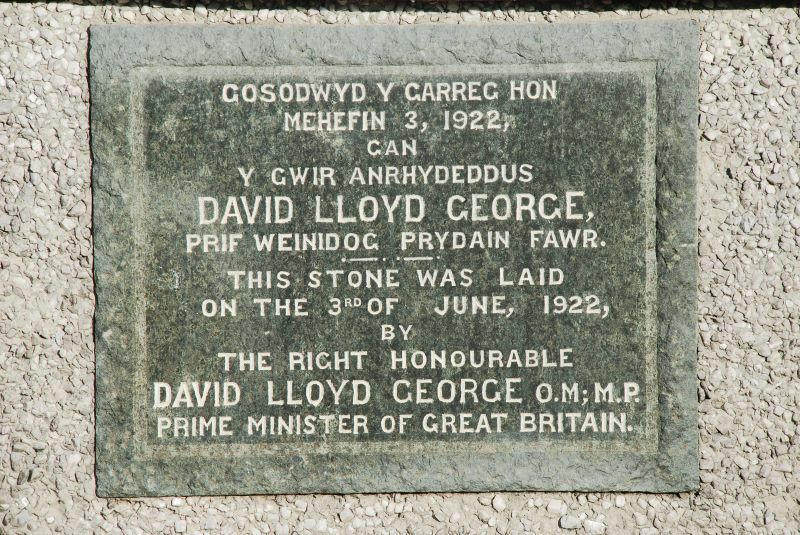 The foundation stone was laid in 1922 by the Prime Minister, David Lloyd George, and the building was formally opened in 1925. It has traditionally served as the principal venue for entertainments in the resort. Roughcast render with swept slate roofs. The style is a fusion of Arts and Crafts in its attention to expressive planning and massing, and Art Nouveau in its fluid forms. Hipped gabled entrance front faces the main road, the gable clasped between polygonal turrets. Shallow segmentally arched entrance with paired doors flanked by narrow 2-light mullioned windows. Balcony with bowed iron rail carried on bold stone brackets to first floor, with 2-light French window, and central canted turret corbelled out above, with windows in its lower section, and a clock above. High-set upper storey windows to either side of 2-lights with central mullions. Battered buttresses to either side of the corner turrets have narrow windows to each floor. Return elevation facing Y Maes is divided into 5 irregular bays by battered buttresses: central bay cuts through the roofline with a high set hipped dormer over 4-light mullioned window. Other bays have similar mullioned windows of 3 and 4-lights below the overhanging eaves, and to ground floor, with segmentally arched side entrance towards the right. Similarly detailed side entrance in return elevation to Lon Ednyfed, which is also articulated by battered buttresses, with high-set upper windows including a dormer. Separately roofed single storeyed halls advanced from this elevation include the original billiards hall facing the main road with a canted bay and entrance in angle with main hall. The building comprises a large main hall with gallery and stage, which is entered from the front via a circular inner hall - the Hall of Memory. This is flanked by vestibules and cloakrooms, with stairs leading to the gallery at either side. Kitchen, committee room and the former billiards room form extensions to the main hall to the E. The main hall employs a Neo-Classical style which is influenced by the Art Deco movement: wide segmentally arched ceiling divided by plaster bay-leaf ribs, with similar enrichment to rosettes surrounding vents. Raking gallery is curved in plan, and has modillion cornice and acanthus frieze. Enriched concave mouldings to proscenium arch of stage. The Hall of Memory is a circular inner hall, with curved oak doors with glazed upper panels (laurel leaf motifs in stained glass), oak dado panelling and black and white tiled floor. Its walls are articulated by plasterwork Ionic pilasters and a beaded cornice, and there is a shallow plaster rosette in the ceiling. Between the pilasters are the oak memorial panels commemorating the dead of both World Wars. The Hall is an excellent example of its type, and a striking design which uses a neo-vernacular exterior intended to be in sympathy with the character of its surroundings, to house a dramatically modern interior. The circular Hall of Memory is an especially notable feature of the design. In grounds set back from the NE side of the open green of Y Maes, close to Holywell Terrace. Set back from the road immediately E of the Church of Saint Deiniol. Diagonally opposite the Church of Saint Catherine, where the lane turns to the E.
Encloses 2 sides of a small forecourt in the front of Capel Seion.